Are you good at networking and trading services with others? Are you able to come up with creative solutions to save money? Are you able to find free services that actually well for your home business? Then you must be practicing bootstrapping. Learning to bootstrap in your work-at-home (WAH) life will start you off on the right path to either keeping your expenses under control while building your home business or while telecommuting from home. When someone is “bootstrapping a business”, this means that the entrepreneur or owner has started the business without any start-up capital and very little assistance from others. Usually when this happens, the entrepreneur or owner is funding the business with his/her savings, credit cards or money cashed in from an investment. Occasionally out of desperation, money is borrowed from a 401(k) or TSP (Thrift Savings Plan) fund but rarely this happens since it will have to be paid back, and there is no guarantee the business will become profitable in time before the money has to be paid back. How Did Bootstrapping Get Its Name? Bootstrapping got its name from a 19th Century fashion trend when boots had straps at the ankles. Everyone has probably heard the expression: “Pull yourself up by the bootstraps.” Well, this is where the term derived. Is Bootstrapping Only About Saving Money? Bootstrapping is a lot more than just getting a discount or saving money. Bootstrapping is looking for ways to save and economize while also adding creativity and bartering. Bootstrapping refers to the times when an entrepreneur starts a company with very little capital and is still able to build the business and then turn a profit. Will My Clients or WAH Colleagues Think I Am a “Tightwad”? While you cannot 100% prevent your WAH colleagues from thinking what they want, they will probably not consider you a tightwad. Instead, they will probably want to hear how you were able to start a business or begin working at home with very little money because most of them have probably been in that situation or know someone who has been. Do Bootstrapping and Creativity Go Together? While it does take a certain amount of “think-out-of-the-box” type of thinking to bootstrap, bootstrapping is really something anyone can do. Even those people, who consider themselves, not very creative, can still learn to network and find free resources. How Can I Begin Bootstrapping to Begin Working at Home or Begin a WAH Business? Begin looking at your current household expenses and see where you can begin scaling back. Make a list of all of the items you will need for your business. Then after each one ask where you can get this for free or almost free? If you need a web site, there are free templates at WordPress, you only need to Google them. There is also www.web.com where your web site is free because the company will place ads on it to pay for it. There are plenty of free email accounts such as gmail or yahoo. If you are in need of an online newsletter service, MailChimp will allow you free service as long as you’ve have fewer than 2,000 subscribers across all lists in your account. MailChimp will allow you to send up to 12,000 emails per month without paying. Aweber will also give you your first month of online email marketing for $1. Then you can also find other fellow entrepreneurs, WAHers, and bootstrappers and begin to barter your services. Maybe you could trade your proofreading skills for a free logo. Decide which skills you can do well and quickly and be ready to trade for those that you do not do well. Is It Really Time Consuming to Search the Internet for Ways to Bootstrap? Not really. While it can and does take some research, sometimes the easiest ways to bootstrap your business are via online networking. WAH web sites often have forums to ask questions or places to trade or barter your services. You can also mention what you are looking for in your Facebook groups and have the interested parties send you a private message. Just be sure you do it in a way that does not appear to be spamming. You can also ask for someone’s opinion on a product or service by sharing a link with your contacts. For example, you could ask what everyone else is using as his/her bookkeeping software. Be prepared to receive a wide range of opinions, which is a good thing. The more options you have, the better to choose one, but have a backup if it doesn’t work for you and your situation. When Can I Begin Bootstrapping? You can begin anytime, really. However, the best time would be while you are planning your business. In addition, you’ve heard the saying that knowledge is power. Have your options ready and see what you can find. Just beware of sales professionals who will try to sell you the deluxe web hosting when you can get by with the basic. This is why networks and forums are a valuable resource. You can also learn from others’ mistakes. 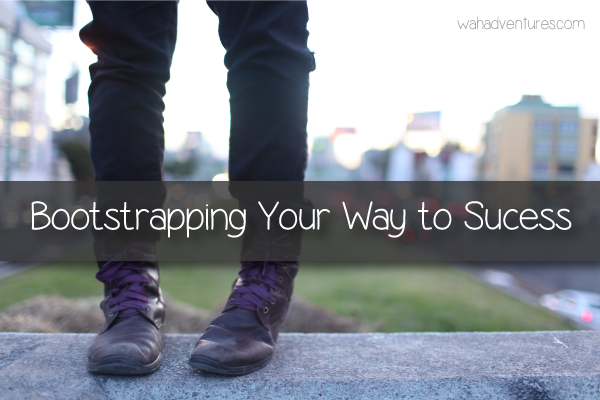 When Should I Stop Bootstrapping? That will depend on several factors: you, your business, your revenue and expenses, and your target market. For a more affluent clientele or market, you may have to start spending more to win their business. However, that does still not mean that you have to go “hog wild” and spend excessively. Sometimes, just going from a brochure you designed in Microsoft Publisher for free to one you designed on Vistaprint.com and spent $40. When Can I Justify Going From Bootstrapping to Investing or Spending More Money? While there certainly isn’t any calendar date for when this can happen, it will again depend. We’ve all heard stories about those who business owners who have priced themselves out of business! Try to use wisdom. The good news is that business expenses that can be proven to the IRS as “ordinary and necessary to the profitability of a business” are also tax write-offs. Is it an ordinary business expense that similar home businesses have? Is it a necessary business expense that leads to more or repeat business? Is this something my business would not be profitable without? Is this something that I am required to have to serve my WAH companies/clients or market? After a few months of bootstrapping and living your dream of working from home, you might be able to not only make money but also help others pull themselves up by the bootstraps. Excellent information Leisa, thanks for sharing! Thanks, TeaJae! Sounds like you might have done a little bootstrapping yourself? I had never heard of bootstrapping before reading this. I’m just starting up Work at Home Pursuit and I’m always looking on forums and other sources to find blogs that may share an audience with me to see about swapping buttons. Do you think that is a good idea? Hello Angel. I have had experience with this myself so I thought I should chime in. Sharing blog buttons is a good way to market and network with other bloggers. Just don’t expect much in way of gaining more traffic from people clicking through your buttons. So, if you have the time and want to reach out to fellow bloggers to grow relationships and so forth- then go for it. But I wouldnt suggest spending too much time as the return on time invested will be low. Finally, you may want to set up a time limit on the buttons. For example, say 3 months or so- that way if you or they want to take the button down they can do so without feeling awkward or rude. Miranda, thanks for coming to the rescue. You are the blogging expert! Angel, glad you stumbled upon this blog! You could always add it to your “Recommended List”. Link sharing or the sharing of resources is a good idea!